The LT Creek Sustainable Neighbourhood Group are supporting a local campaign to protect an area of local bushland by having it officially gazetted as the Awaba State Conservation Area. The area is adjacent to the Sugarloaf State Conservation Area and the Awaba State Forest. The area provides an important wildlife corridor from the Watagan Mountains to the Lake Macquarie State Conservation Area, and contains a range of ecological communities. The establishment of the Awaba Conservation Area (Awaba Nature Reserve), on Crown Land between Awaba and Dora Creek was recommended in 1972 by the National Trust of Australia (NSW). 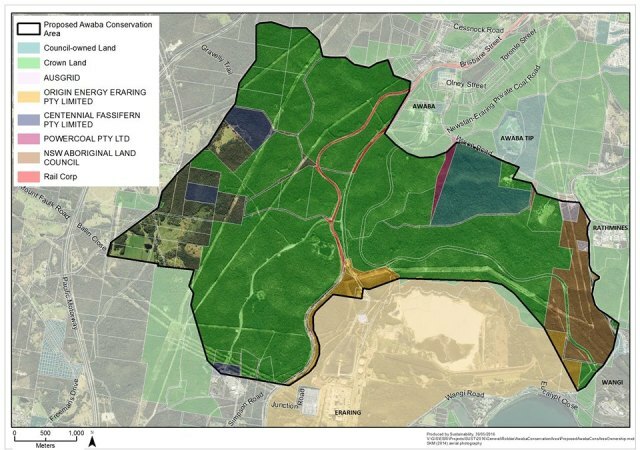 In 1995 Lake Macquarie City Council commissioned an ecological assessment of the proposed site that concluded the proposal by the National Trust Australia was justified and that approximately 2,190ha should be set aside to assist in conserving and protecting rare and endangered flora species and protect the habitat of endangered species in the area. In 2009 the NSW State Government acknowledged the importance of the land with its high conservation and biodiversity values. Lake Macquarie City Council in 2013, acknowledged the proposed Conservation Area in the Lifestyle 2030 Strategy, as well the threats and stresses to ecosystems and biodiversity. Visit the West Lake Macquarie Conservation Project for more information.